I just sat down at my laptop after a couple of days away and realized quickly that I’d forgotten to tell you I’m on spring break this week. To all who inquired about my whereabouts, sorry! That looks like the esteemed Dr. Bill Martin at below right, no? Yes, that is Dr. Martin. And, if I don’t miss my guess, I think that is Belinda Davis at the top of the pyramid. And maybe Duane Roberts, center, and Francis Fey on the right? That’s what I thought too! I’m e-mailing him a link! 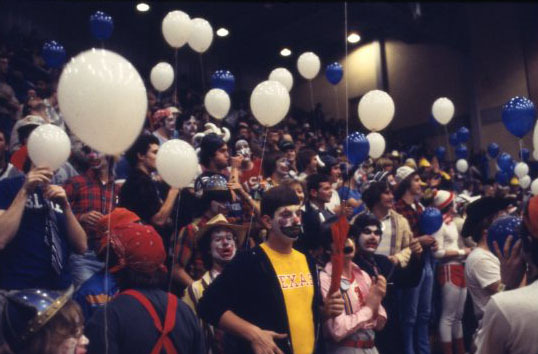 But it wasn’t “clown night” – the UT coach (who’s name escapes me right now) referred to the old Autry Court as a three ring circus if I remember correctly. So… we made it circus night to honor his comments. On Texas’ next trip to Autry Court, the Longhorns were greeted by students dressed as clowns and circus performers. thanks for the look up – I was heading out the door and couldn’t do the research. I wish the photos were clearer – looks like some familiar faces in the background and I’m pretty sure I was there…. I think the UT coach had made a crack comparing the Rice team as clowns at an earlier game saying something like “where are the rest of the clowns?”. Since Sid Rich had come dressed as Vikings the year before we decided to come dressed as clowns for the game. That was Bill Martin there and the guy in the white turban and beard was Joe Moramarco. Note there are a few guys in the background with their Viking helmets from the year before. Marc – any chance that’s you in the S.L.O.B. shirt on the left side of the third picture? Could be. That would be the sort of costume I would have been wearing, but with the balloon covering the face I can’t say for sure. I had forgotten about that game. I was there, and it was great fun. 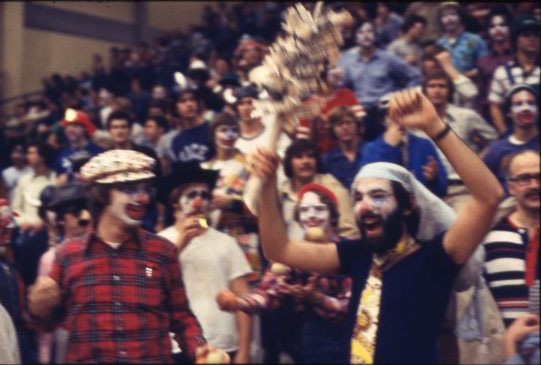 After Coach Lemons made the remark, Assistant Coach Butch Estes and I (basketball SID at the time) decided to promote the UT game at Autry Court as “Clown Night” and encourage everyone to come in costume. An AP wire photo of one student juggling lemons in front of the coach made newspapers across the country. Melissa – Rice basketball has had a number of these fun games with a theme. Along with this one, there was a “jungle gym” game to commemorate the lack of air conditioning, where alumnus Kirk became famous for his grass skirt, and an ESPN midnight game against Fresno State and Tarkanian where Neal Farmer did a Chronicle story with pictures of students and fans in PJs with their blankets and pillows (Glen and I were pictured with our giant bunny slippers). I imagine readers can fill in more dates and details if anyone’s interested in tracking these down. 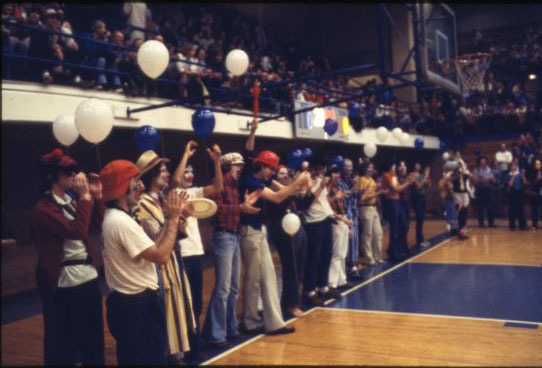 Fun times when the gym was filled with boisterous students and fans! Schuler’s substitution pattern was named the Schuler Shuttle. My favorite post-game comment from Abe Lemmon’s was when asked if he was threatened by the clowns, he said “I was in the war with Germans and Japanese”. 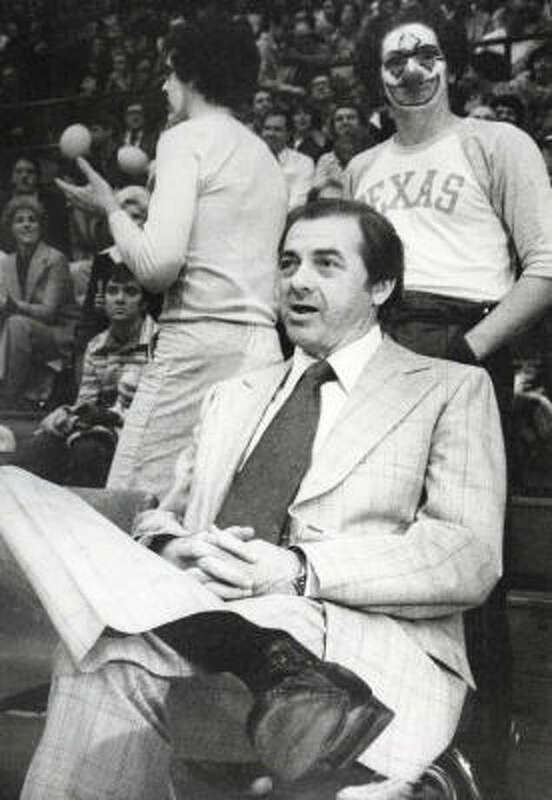 That quote was in the book “Longhorn Hoops:The History of Texas Basketball”. I remember the quote a little differently, something to the effect of “I was on an island with 100,000 Japanese during WWII…a few clowns can’t scare me”.